Even before NASA was created, civilian and military labs were in search of astronauts. The briefing chart, once stamped "SECRET" but now turning yellow in a NASA archive, shows a smooth curve with the names of nine test pilots plotted according to their weights. At the lower end, between 150 and 175 pounds, are Bob Walker, Scott Crossfield, Neil Armstrong, and Robert Rushworth. Sloping from there up to 200 pounds, straining the limit of how much human payload an Atlas rocket could lift into space, are Bill Bridgeman, Alvin White, Iven Kincheloe, Bob White, and Jack McKay. The top of the chart reads "CREWMAN AVAILABILITY." It was presented on June 25, 1958—eight months after Sputnik and four months before the birth of NASA—to Air Force officials making hurried plans to put a "Man In Space Soonest," as the secret project was called. On this particular summer day, to this particular briefer, these nine guys seemed most likely to become the first people in orbit. Other names that might just as well have been included but weren't: David Simons, Joe Kittinger, Clifton McClure, maybe even Airman 1st Class Donald Farrell. All had done experiments in preparation for spaceflight in the late 1950s, and all had reason to believe, if only for a while, that they might take mankind's first leap off the home planet. As it was, MISS never flew, and only Neil Armstrong went on to become what we now think of as an astronaut. But in 1958 the question of who-or even what type of who-would be the first spaceman was far from settled. To a casual newspaper reader, an obvious pool of candidates would have been the volunteer test subjects at places like the Air Force School of Aviation Medicine at Randolph Field in Texas, which had been dabbling in space-related research for several years. In February 1958, for example, a 23-year-old airman from the Bronx named Donald Farrell was locked in a chamber with an artificial atmosphere for seven days, long enough to simulate a moon flight. U.S. Senator Lyndon Johnson of Texas, happy for any good news about America's loser of a space program, gushed over Farrell's endurance test, and the New York Times pronounced him "in one sense, the first 'space traveler.'" Working at the same time in New Mexico was a group of space researchers with an even more adventurous bent. The unspoken motto at Holloman Air Force Base's Aeromedical Research Laboratory was "Never do unto others what you wouldn't first do yourself." So there was Colonel (and Dr.) John Paul Stapp—a graduate of the School of Aviation Medicine who had been Chuck Yeager's flight surgeon when he broke the sound barrier-pulling 46 face-squashing Gs on a "rocket sled" in December 1954. Designed to test how much force a pilot ejecting from high altitude could withstand, the sled was based on a German design. During his historic run, Stapp accelerated to 632 mph in five seconds, then slammed to a stop one and a quarter seconds later. Joe Kittinger, a try-anything test pilot and safety officer assigned to Holloman, was flying a T-33 with a cameraman in back to photograph the run from overhead, but he couldn't keep up. Even today, Kittinger calls Stapp "the bravest man that's ever been." If so, he was in good company at Holloman. In 1955, Stapp asked a young biomedical researcher on his staff named David Simons, who had spent two years launching animals to the edge of space, if he'd be willing to make the trip himself. Simons said yes, and Project Manhigh was born. Kittinger made the first ascent inside the tiny Manhigh capsule-a Jules Verne contraption suspended from a 200-foot helium balloon-in June 1957. He was followed by Simons on a full-up, day-long flight two months later, and by Air Force Lieutenant Clifton McClure, a gung-ho volunteer, the following year. As a scientist, Simons wanted to see for himself what it was like "up there"—what the stars and the clouds looked like, and how humans would fare on this strange new frontier. Inside his phone-booth-size capsule he reached Manhigh's top altitude of 101,516 feet, which put him above 99 percent of the atmosphere, high enough to see the blackness of space and the curve of Earth below. At the end of his 32-hour ordeal, which he found alternately exhilarating and terrifying, he dropped down in a South Dakota field and was greeted by a farmer, just as Yuri Gagarin would be in the Soviet Union four years later. Kittinger, the most daring of all, did Simons one better with Project Excelsior in 1960, jumping from the open gondola of a balloon at 102,800 feet, still the world's record altitude for a parachute jump. On the way down, he became the only person to exceed Mach 1 in a freefall. Near the end of the jump, after his main parachute opened, Kittinger could be heard on the voice tape repeating, "Thank you, God, thank you." While the official report for Simons' Manhigh flight says it was "intended to investigate the human factors of space flight," most of the Holloman space research was tolerated by skeptical Air Force brass only because of its applicability to high-flying airplanes like the U-2. Even as late as 1957, says Kittinger, "space was a dirty word" in the Pentagon. The launch of Sputnik on October 4 changed everything. Suddenly each of the military services knew exactly how to send someone into space, and quickly. The Navy's Manned Earth Reconnaissance (MER) program would orbit an inflatable, winged reentry vehicle by 1960. Wernher von Braun, at the Army Ballistic Missile Agency in Huntsville, Alabama, proposed a joint services project called "Man Very High." He had watched the Air Force balloon flights with great interest, and he invited Simons and Kittinger to Huntsville to discuss modifying their Manhigh capsule for a Redstone rocket. Simons came away excited, but by April the proposal had been shot down. Von Braun repackaged it as the Army-only Project Adam, a ballistic, suborbital shot up to 150 miles, with a man crammed inside a cylindrical pressure vessel much like Manhigh's. He even tried selling it as a way to move soldiers quickly around the globe using missiles. But Project Adam, too, ground to a halt. The only scheme that gained any real momentum in 1958 was the Air Force's Man in Space Soonest, which would use first a Thor, then an Atlas booster, to put a blunt capsule in orbit. The MISS concept would later morph into NASA's Mercury project, and several of Mercury's guiding spirits were involved as advisors, including Max Faget and Robert Gilruth of Langley Field in Virginia, a research center operated by the civilian National Advisory Committee for Aeronautics. By March 1958, MISS was the subject of frequent high-level meetings, and David Simons and John Stapp were among those doing the briefing. At one such meeting at NACA's Ames center in California, Simons outlined a program of Manhigh-style balloon flights that could help train the pilots for MISS. (An Ames official wrote in the meeting minutes, "Should I call him a pilot or a biological specimen?") Stapp recommended that the first man in space be either an engineer with medical training or a medical man with engineering training. Because they'd been thinking about it for years, the doctors were the experts when it came to assessing the risks of spaceflight. By 1958, they had pretty well dismissed most of the worries, but a few unknowns remained. In his 1953 book Man in Space, Heinz Haber of the School of Aviation Medicine at Randolph, who with his brother Fritz had designed Donald Farrell's space simulation chamber, wrote that weightlessness "will be the most dismal and the strangest" effect awaiting the first travelers beyond Earth. But the medical researchers did not have this line of inquiry to themselves. As early as 1950, Chuck Yeager and Scott Crossfield, the North American Aviation test pilot who would fly the first X-15, had both tried a method of simulating zero-G invented by the Haber brothers-taking an aircraft on a steep climb, then coming "over the hill" to achieve half a minute of weightlessness. In the 1950s, just about every hot pilot tried the technique at least once, according to Crossfield. Joe Kittinger flew many such runs at Holloman with David Simons on board as a researcher, and both enjoyed the feeling. So did Crossfield, who liked to do his weightless runs upside down. Crossfield had done other "extreme" tests, including pulling 9 Gs in a centrifuge, and was happy to report no pilot-related show-stoppers for his X-15 rocket plane, which was being designed to climb much higher into space than Manhigh had, if only for a few minutes. Despite his sanguine assessment of the risks, some scientists—not serious researchers like Stapp, whom he respected, but outsiders—continued to predict dire consequences for the first astronauts. "I think some of those guys were just looking for big government contracts," he scoffs today. It wasn't just intellectual dishonesty that bothered Crossfield. He feared that the worry-warts would kill the X-15 before it got off the ground. In the post-Sputnik scramble, he and others at North American had proposed an advanced orbiting version of the rocket plane as a way to achieve "man in space soonest." That idea had been rejected in favor of the MISS ballistic capsule. Now Crossfield saw the whole thing being turned over to the medicine men and the missileers, who he perceived as having a "great disdain for wings and pilots." In April 1958 he was asked to serve on a group chaired by Randy Lovelace, a leading figure in aerospace medicine, to set guidelines for human factors and crew training for the fledgling space program. Crossfield did his best to steer the conception of an astronaut away from "passive biomedical subjects" and toward the kind of test pilots who were lining up for the military's X-15 program. The panel's final report, issued in October, called for potential crew members to be checked out in ground simulators, centrifuges, balloon capsules, "and finally in supersonic aircraft such as a two-place X-15." More than half the names on that June 1958 MISS briefing chart would in fact fly the X-15: Armstrong, Rushworth, McKay, Walker, and Bob White. The rest were stars at Edwards Air Force Base. Bill Bridgeman, a test pilot for Douglas Aircraft, had taken his company's Skyrocket nearly to Mach 2 in 1951, and was even quoted by Heinz Haber in Man in Space: "I pick a spot in the sky, and I imagine I'm going right on through a hole, out of the earth's orbit. Am I driving this airplane or is it taking me somewhere? I am awed and apprehensive." Air Force Captain Iven Kincheloe had already been dubbed "Mr. Space" by the press for piloting the Bell X-2 rocket plane to a world's record of 126,200 feet in 1956. Two weeks before his name appeared on the MISS weight chart, he had tested a science fiction-y spacesuit called the Mark I in a simulated flight to 100 miles. 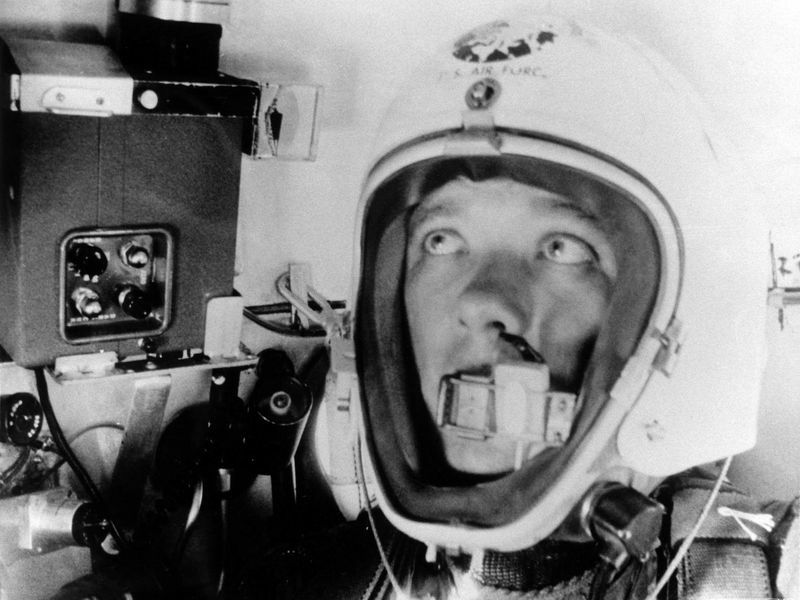 If anyone was primed to be the first space pilot, Kincheloe was. But a month later, he crashed to his death in an F-104 over the Mojave Desert. As for Crossfield himself, "Yes, I was interested [in making the MISS flight]," he says. "However, I wasn't pushing it." He had his hands full with the X-15, and was still holding out hope that an orbital version would fly someday. Besides, Lovelace and others joked that they would blackball him if he volunteered. "I was too independent," he says. "I had a bad habit of turning off the radio if I didn't like the help I was getting from the ground." In the end, it turned out to be neither the Holloman crowd nor the rocket plane pilots who became the first men in orbit. All this time, another, stronger undercurrent had been flowing, which led to the creation of a new civilian space agency and put the Air Force out of the man-in-space business. Immediately after opening shop in October 1958, NASA set about picking candidates for Project Astronaut, soon renamed Mercury, which was essentially the MISS concept in new clothes. Throughout the fall a small team of doctors and psychologists in NASA's Space Task Group struggled to come up with a list of requirements for the first astronauts. By early December they had drafted an invitation to pilots, arctic explorers, deep-sea divers, mountain climbers, and anyone else who did hazardous work in severe environments and who had demonstrated ability to "react adequately under conditions of stress or emergency." Their call for "research astronaut-candidates" was to have gone out to the public on December 22. But hardly was the plan formed when NASA officials realized the net was cast too widely. The Mercury project was moving too fast to spend valuable time screening proposals from every adventurer in America. So NASA's new administrator, Keith Glennan, and his deputies decided to limit the pool to military test pilots. When they presented the idea to President Eisenhower shortly before Christmas, he okayed it immediately. For Ike, it was a natural decision. He had zero interest in the romance of space travel, and was only intrigued by the prospect of military men spying on the Soviets from orbit. "Eisenhower was not picking the first humans to go to the moon," says American University space historian Howard McCurdy. The people he had in mind "were more in the legacy of Francis Gary Powers than Lewis and Clark." So that was it. Only military test pilots, who already had security clearances, need apply. Strictly interpreted, that meant no Scott Crossfield or Neil Armstrong, both civilians. And no David Simons, who was a physician. The three Manhigh pilots at Holloman had different reactions to the NASA decision. Kittinger, the only one who was a military test pilot, talked to Stapp about applying, and his boss thought he would have a good chance. But in the end, he decided to stick with what he was already doing, including preparing for the high-altitude Excelsior jumps. Clifton McClure, the 26-year-old Manhigh pilot who'd been dreaming about spaceflight since he was a kid, wanted badly to go into orbit, and was "devastated" to not have the chance, according to Simons. Simons downplays his own disappointment at not being invited to participate in Mercury. He threw his hat in the ring to become director of biomedical research for the astronauts, but was rejected. So he went on to a rewarding career in mainstream medical research, ending up at Emory University in Atlanta, where he lives today. Don't look back, he says. And yet, every so often, he surely does think back on that day in August 1957, six weeks before Sputnik, when he had outer space all to himself. Simons was the first man in history to watch the sun rise and set from above the atmosphere. When he took a break from work and just sat there munching sandwiches and chocolate bars in his tiny capsule 20 miles up, he turned reflective. Later, in his official pilot's report, he wrote: "It seemed right that I should be going toward space, as if that was where I belonged. In this sense I experienced a separation of emotional ties and interests from the earth below and felt an identification with the void of space above." Unlike many of the astronauts who would follow him, Simons was always more interested in the place he was going than in the machinery that took him there.